Your friends and family will be dazzled when you create custom tropical treats with your Creative Café Frappe Maker! The Creative Café Frappe Drink Maker allows kids to enjoy delicious, colorful, and coffee-free “crème” drinks in the comfort of home. The Frappe Maker is easy to use. Just add a flavor mix to milk (or a milk substitute) in the frozen Frappe Maker and stir. Then serve your delicious creation in an authentic Frappe Cup! The flavor mixes include Apple, Mango, or Strawberry Cream flavors. You can enjoy separately or layer your way to a delicious Frozen Rainbow. Our little creators loved how easy it was to make beautiful and delicious treats all on their own! Luckily I had read the drink maker must be frozen overnight (or 12 hours) so I had it all ready to go before I let them see the box. None of us liked all the flavors, but we all like some of them so our rainbows were varying color combos. Now that the mixes are done we have started a list of other ideas including: juice, chocolate milk, yogurt, freeze dried fruit, and flavored milk powder. We are excited to see what works! I couldn’t help myself so we talked a little about how crystals form when liquids freeze. This of course led to a ton of questions, but luckily we had a cool treat to enjoy while we explored the science behind ice. We loved how easy it is for kids to do all the steps. There is no heat or anything sharp which makes it easier to do with multiple kids. The Creative Café Frappe Maker 1 Frappe Maker Freezer Cup, 1 Reusable Straw with Spoon and 1 Reusable Frappe Cup with Lid. It is easy to use the Frappe Maker to make a couple batches of frozen treats, but only having one Frappe Cup was a bummer for us since we have 3 kids. The cup and spoon straw look just like the ones in drinks Adventure Parents have been known to indulge in so it would be nice if each kid could have their own cup. We also wish there was a couple packets of each of the flavor mixes. There is a Barista Bar Refill for Creative Café Barista Bar so we are hoping there will be a refill set for the Frappe Maker, that includes more cups and straws, soon! 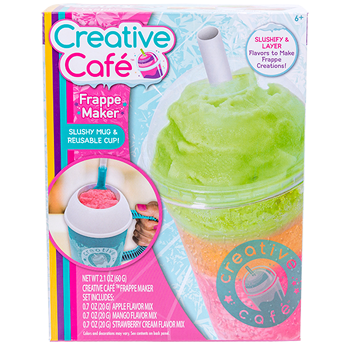 The Creative Café Frappe Maker is best for kids 6 years and older. Pick up your own Creative Café Frappe Maker at major retailers nationwide (like Target) for $14.99. You add two spoonfuls of flavor to each serving so each flavor packet makes two frozen servings. One frozen serving fills the Frappe cup about half way. If you work quickly you can make two or three servings before the Frappe Maker thaws too much. Skim milk yielded the best results, but other milk types also work.